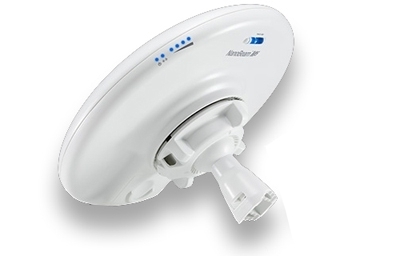 • All-in-One Design: The Ubiquiti Research and Development team combined the radio and antenna to create a more efficient and compact CPE. The NanoBeam gets maximum gain out of the smallest footprint. Providing increased performance from its faster processor and innovative mechanical design at a low cost, the NanoBeam is extremely versatile and cost‑effective to deploy. • All-in-one design: The NanoBeam provides both the radio and antenna in the smallest possible footprint. • Convenient alignment: The NanoBeam pivots on its ball joint for easy aiming. • Versatile mounting: The NanoBeam can be mounted in almost any position needed for line of sight.